Many want to make crossing Cambridge Street near the I-90 ramp a lot safer, please. Things that happened in August 50 years ago: The launch of the Beatles’ first American multicity tour. Congress’s passage of the Gulf of Tonkin resolution. And the inauguration of the MBTA. The train system, of course, hails back to the 19th century. But the agency that currently runs the region’s subways, trolleys, buses, ferries, and commuter rail — the Massachusetts Bay Transportation Authority — came into being Aug. 3, 1964, exactly 50 years ago today. But that agency was focused on the immediate Boston area, and public officials worried that the lack of cohesion between Boston’s transportation system and the rail and bus operations in surrounding suburbs was hampering the region’s development. Their worries were heightened by Massachusetts residents’ growing reliance on cars: Between 1946 and 1963, ridership on the MTA dropped from 433 million annual trips to 175 million. State legislators dreamed up a new system, a government agency that would unify all the railways, subway lines, and bus routes in the Massachusetts Bay area. And at exactly noon on Aug. 3, they made the switch. “MBTA Sworn In — $255 Million Transport Plan Starts — MTA Dead,” read the Globe’s headline. “Unquestionably the most daring and provocative legislative action every taken by a state government in support of transit,” said the president of the American Transit Association at the time. Last week, I asked the T’s general manager, Beverly A. Scott, what she thought those first administrators of the newly established MBTA would have thought of today’s system. Below are six ways in which the establishment of the MBTA changed transportation in Eastern Massachusetts. Gateway to suburbia: The MTA kept its purview limited to 14 cities and towns tightly clustered around Boston — the system’s furthest reaches extended only to the likes of Arlington, Newton, Milton, Malden, and Revere. Once the switch happened, the MBTA was in charge of 78 cities and towns, and began the process of taking over control of a commuter rail system that had previously been operated by private railroad companies. New subway stops: With a $255 million investment, the T started to build new stations — quickly. By 1971, the Red Line had extended down from Dorchester’s Columbia Road to Quincy; in another few years, that line would be further extended to Braintree, and the Orange Line would add another half-dozen stations. Lettered trolley branches: Similar to the need for color-coded subway lines, transit administrators recognized the need to differentiate the branches along the westbound trolley system. They came up with A, B, C, D, and E. In 1969, the A-branch, which went to Watertown, was abandoned for bus service. The T: Around the time of the switch to the MBTA, legislators went on a European tour to check out better-developed transit systems, and identify ideas they could crib for the Bay State. In Stockholm, they were enamored by the subway’s system’s simple “T” logo. “It was less of a tongue-twister than the MBTA,” Clarke said. Helvetica: Ah, that oft-ballyhooed typeface, beloved by graphic designers and font savants the world over. To go along with the system’s new approach, T officials wanted a new, modern look for their subway signs — and what better look than an up-and-coming Swiss typeface known for clean, graceful lines? According to the American Institute of Graphic Arts, the T was the first transit system to use Helvetica without alterations. They’ve stuck with sans serif look ever since. Ever tried crossing Cambridge Street in northeast Allston? It feels almost impossible, with cars zooming by at near-highway speeds and few places for safe crossing. 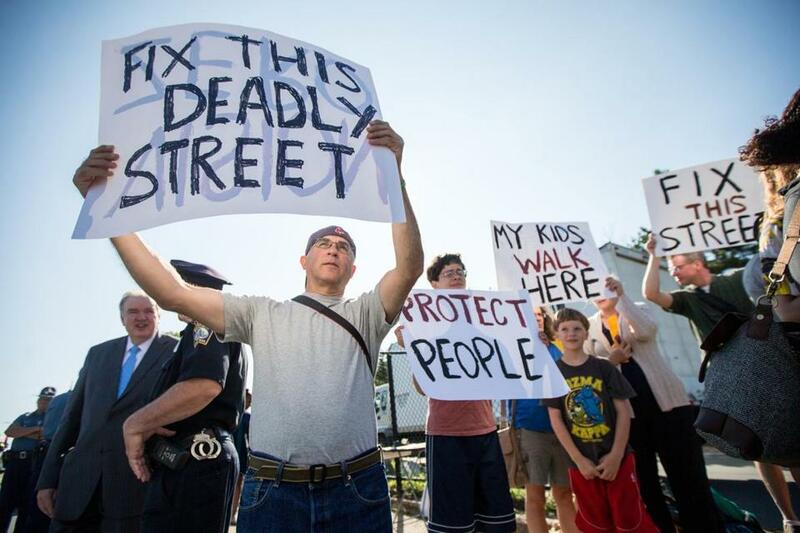 A group of Allston activists wants to fix that. Last Tuesday, about 30 residents gathered in the middle of the intersection at Cambridge Street and Seattle Street — that tiny spit of median where the street branches into the Interstate 90 onramp — and held up signs calling for temporary improvements. Another one: “A person died here, ” referring to the 26-year-old man who was struck and killed by a car last month as he crossed that stretch of road on foot at night. The street is especially prone to pedestrian traffic because it straddles upper and lower Allston, and features a bus route that drops off passengers along the busy thoroughfare. Cambridge Street is due to receive a complete overhaul in several years as part of the $260 million I-90 interchange rehabilitation project. But that won’t even get started until 2017. In the meantime, residents say, they want safer streets with low-cost, stopgap measures: Jersey barriers to narrow the path toward the Pike, forcing cars to slow as they approach the crosswalk that precedes the ramp. New bulbs for nonworking streetlights that, they said, make it hazardous to attempt to cross the street at night. Painted bike lanes would also help cyclists navigate the wide, speedy road and help drivers recognize the need to give them room. “And we can’t have someone killed in the street every year for the next seven years,” added Galen Mook of Allston. State Senator William N. Brownsberger, state Representative Kevin Honan, and Boston City Councilor Michelle Wu all attended the rally. Another in the crowd was Lisa Smith of Allston, whose 12-year-old son, Barrington Brinson, was killed last year when he was hit by a van as he crossed Cambridge Street. Smith said she wants to see the city’s transportation department take steps to force cars on the thoroughfare to drive more slowly. She’s talked to the Boston Transportation Department; they installed signs encouraging people to use the crosswalks, rather than jaywalk, but Smith said the crosswalks are so infrequent that people continue to try to scurry across where it’s convenient. Transportation officials need to take more aggressive measures to ensure that cars aren’t speeding, and are better able to watch out for people crossing the street, she said.